The development of machinery for the manufacture of paper has caused the general public to come to the erroneous conclusion that hand-made paper is difficult to obtain to-day. Hand made paper is manufactured in England to-day, and is made by a highly skilled body of workmen who are members of the above named Society. It can be obtained from any stationer. The Society came into existence in the year 1800, or just about that time when paper machines first began to make their appearance. Previous to the year 1800, the manufacture of paper by hand was carried on by workmen who were members of a guild; the guild became somewhat loose in its organisation with the result that the paper began to deteriorate, as the guild failed to keep its workmen to a high standard; and it was replaced by the Original Society. All the members have to serve an apprenticeship of seven years to the art of papermaking. Every mill in the United Kingdom which makes paper by hand employs members of the society for the actual making of the paper. It is interesting to note that the membership of the society can be traced from generation to generation, son following father in unbroken succession. The same applies to the employers.The employers are now known as "The Paper Maker's Association of Employers of Carded Labour." The title is the outcome of a rule of the society which demand that every apprentice on the completion of his apprenticeship shall obtain from the society what is termed his "Card of Freedom," without which no man can be employed in the making of hand made paper. A facsimile of the "Card of Freedom" is appended.The result is that after many years of tuition there exists a body of workmen who are highly trained and who exercise a freedom not enjoyed by any other organisation of workmen in the country. 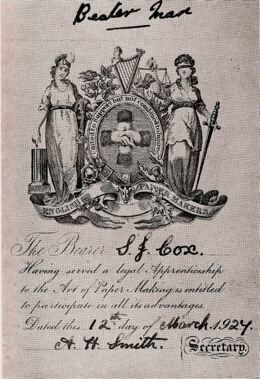 The society has taken action in the Courts of Law to expose the false descriptions given to machine made papers which have been imposed on the unsuspecting public as had made paper.It is noticeable that when machine made papers of a high grade are placed on the market they are described as "equal to hand made" or "imitation hand made," such descriptions being a tribute to the qualities of the real thing and a proof of its superiority over any mechanical production.No machine can produce the dovetailing of the fibres which is created by the "shake" of the vatman's arm when making the hand made sheet. Disputes in the trade are rare, and when such do occur negotiations are always conducted with the Employers' Association. Whatever the outcome of the negotiations may be, it is always observed faithfully on both sides. When cases have been arbitrated on, the arbitrator has been struck with the friendly attitude adopted by both sides. This speaks well for the complete understanding which exists between employers and employed. The firms which make hand made paper own mills which have been in existence many years, in most cases over a century. The same method of making hand made paper is still in operation to-day as it was hundreds of years ago. There is no alteration in the principles of making. After reading this booklet you will be able to recognize and appreciate hand made paper and you will know that you are purchasing something which is the work of men's hands, and embodies the craftsmen's personal interest in the production. Some samples of hand made paper were submitted to one high official of the country a short time ago, who in reply wrote as follows:- "One seldom sees nowadays such beautiful specimens of artistic paper." The gentleman was not aware that the paper was produced by hand, his knowledge of hand made appear being very limited; this applies to the majority of users of paper to-day, they do not know what they are buying, with the result that some unscrupulous shopkeepers and stationers sell machine made papers and tell customers that it is "just as good" as hand made.If ever you are in doubt as to the genuine article, please communicate with the Secretary, Original Society of Paper Makers, Maidstone, who will give you the names of the actual firms who supply the genuine hand made article.